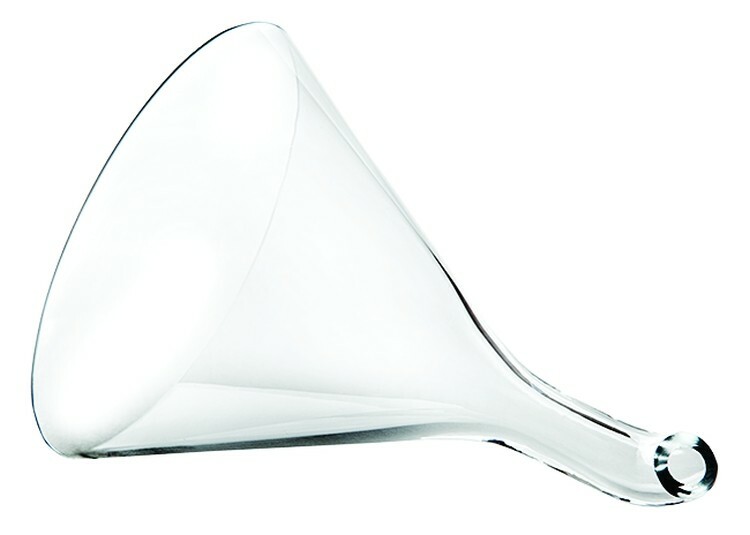 Beautiful clear glass funnel with curved spout assures the wine flow will be directed towards the wall of the decanter while decanting to give adequate aeration of the wine. 18/8 stainless steel brushed outside surface, polished interior surface. 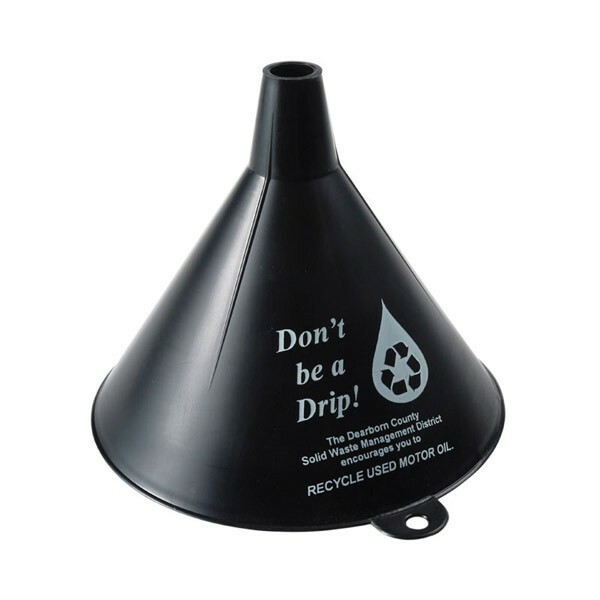 This gracefully shaped funnel offers a finger grip ledge on one side. At the base the wine flows outward horizontally through two slits on each side measuring 0.3 inches each. This helps to aerate the wine. 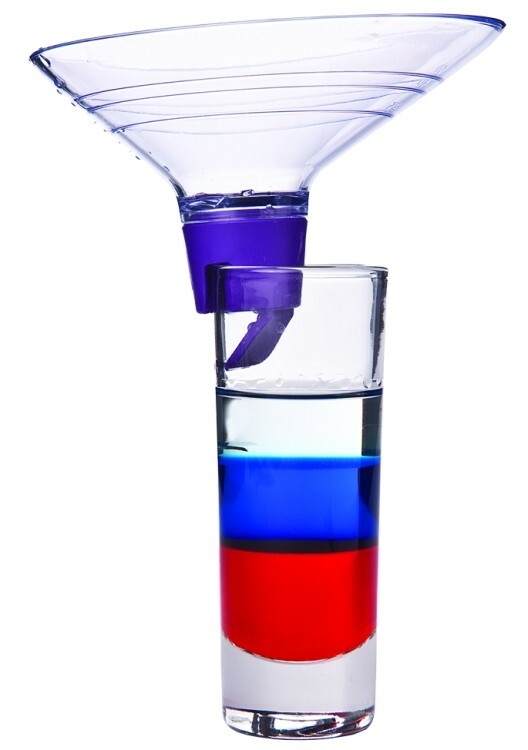 Comes with sediment screen with a central stem 3" of which goes inside the funnel and 1 1/8" of the stem rises above as a finger grip. 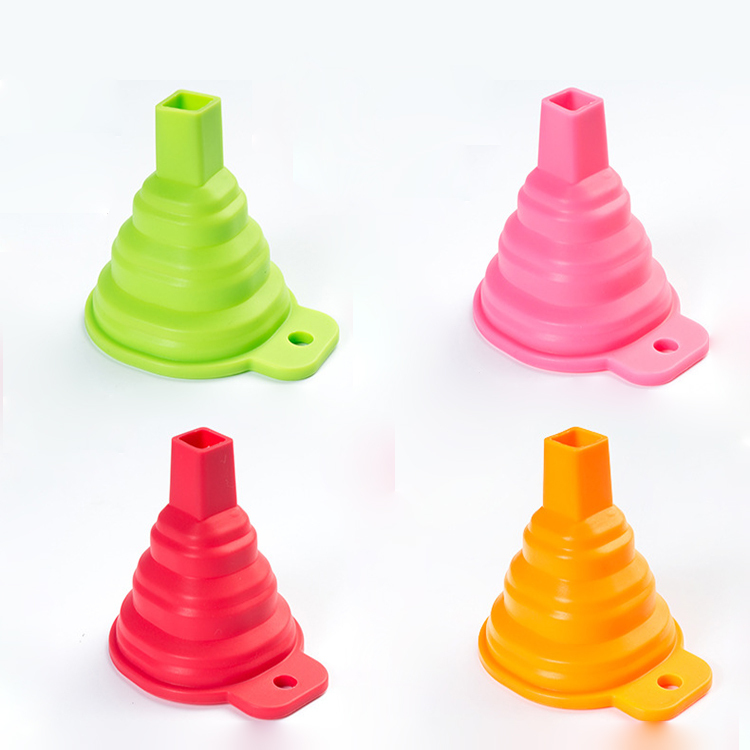 The funnel is made of organic environment-friendly silicone, which is durable and can be reused. It is suitable for kitchens or outdoors, because it can be folded and stored, even in shallow drawers. The transfer of liquid or dry ingredients is feasible and keeps stable in bottles or cans. It can be a promotional gift for the trade show. Welcome your color and logo. 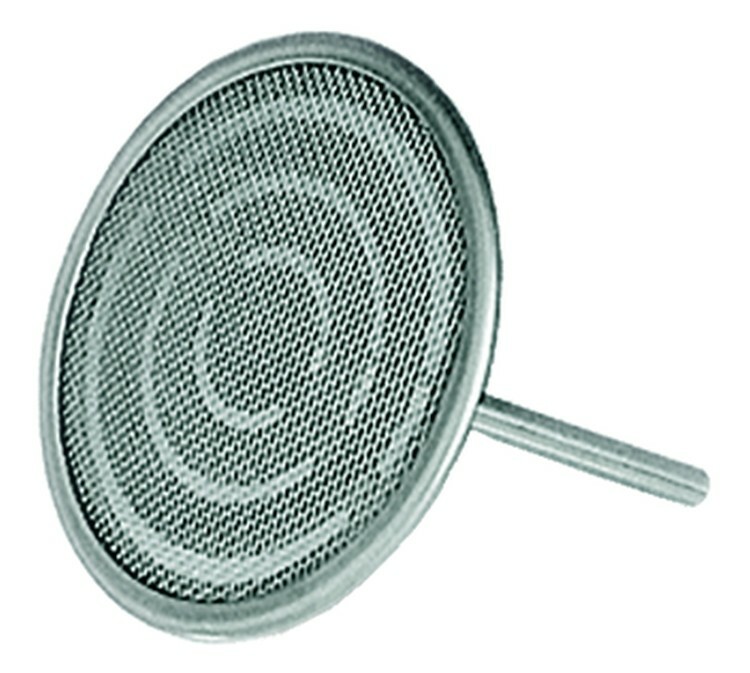 Fine mesh stainless steel filter screen included. Comes with burgundy fabric storage bag. 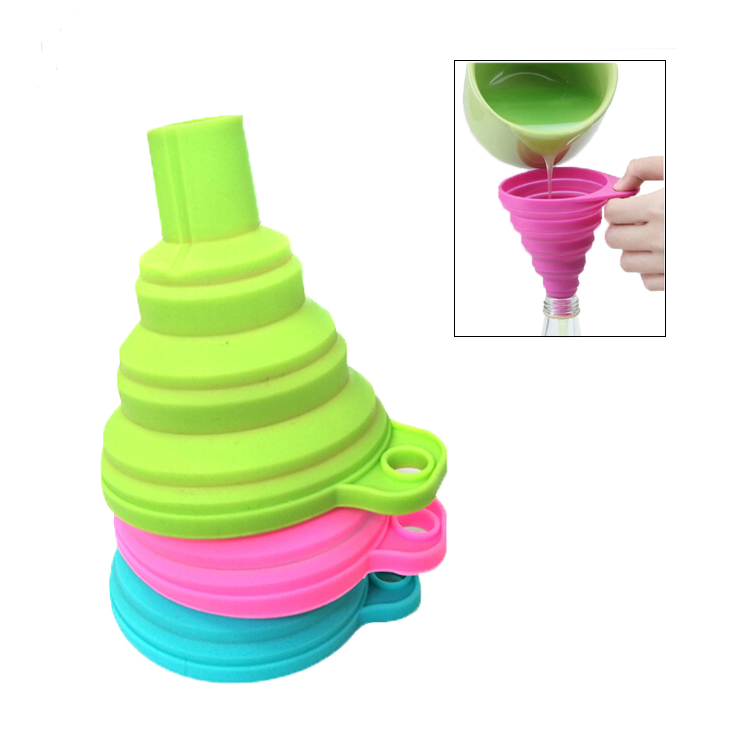 Made of food grade silicone, this collapsible funnel features portability for outdoor use. Any PMS match colors are available and the customized screen printed imprint comes on the top area. A hanging hole comes on the top funnel. This is deal promotional product for cookware, supermarket promotion. 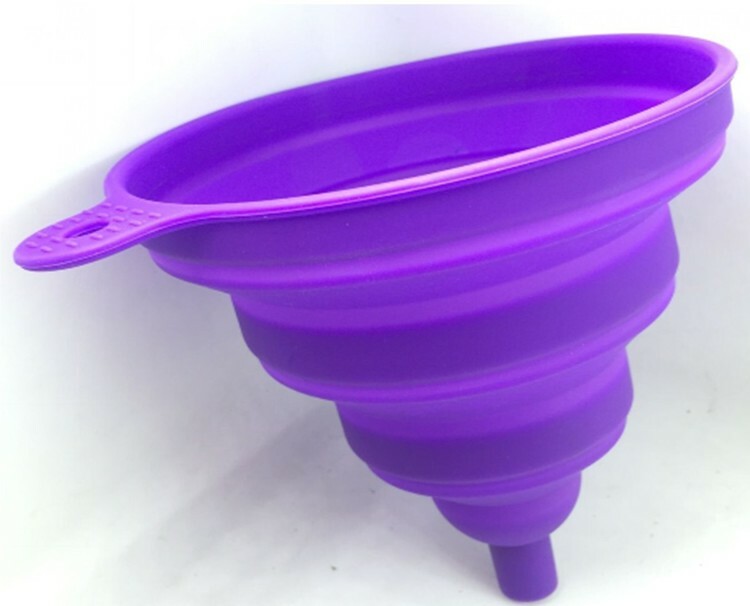 The funnel is made of silicone which is durable and reusable. It's suitable for your kitchen. Also, it's perfect for you when you go out for a travel. The diameter of it is 4 5/16 inches and the height is 4 5/16 inches when it is unfold. It's very convenient to store and carry because it can be folded. It can be a promo gift on some trade shows. Welcome your color and logo. The traditional Pousse Cafe or layered cocktail, is an after dinner drink consisting of several liqueurs of different colors and specific gravities poured so as to remain in separate layers. This remarkable tool mounts on the small liqueur glass. The design slows down the fluids as they are being poured and creates layers based on the density of the liqueurs. Three graduated measuring lines in the funnel. 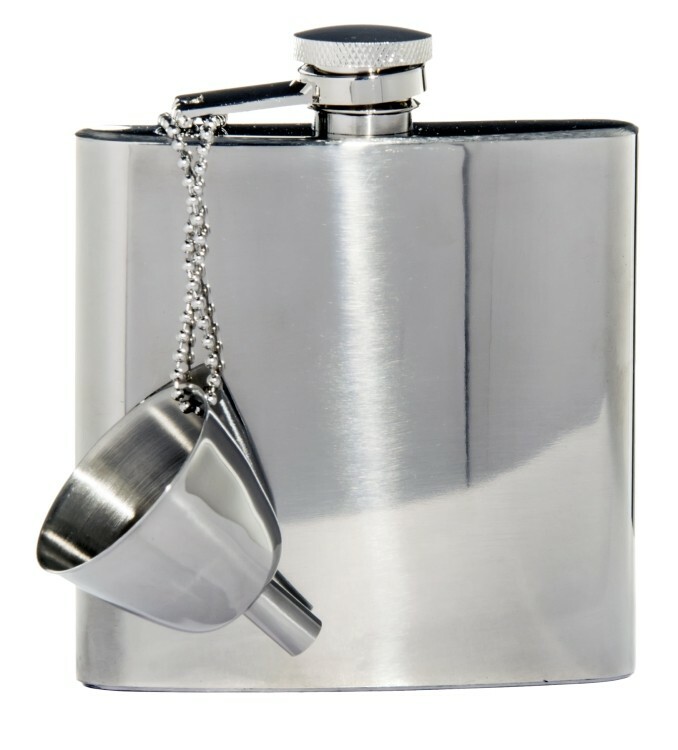 Flask Funnel. 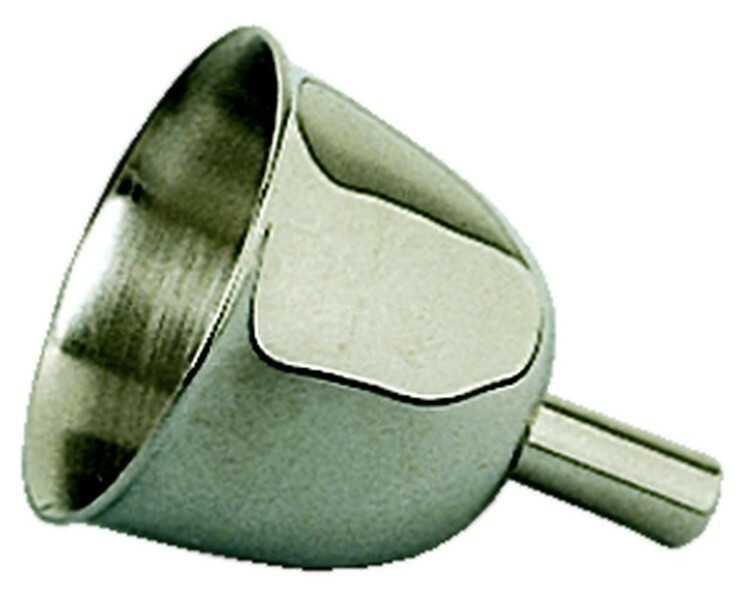 -Bowl diameter: 1-1/2" -Bowl Depth: 5/8" -Height: 1-1/8"
Silver plated. 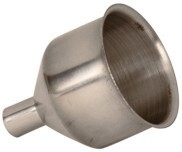 Removable fine screen stainless steel filter with attached stem. Wine flows through three holes just above the closed bottom of the funnel. This causes the wine to splay (spread outward) down the inside walls of the decanter. This oxygenates the wine more, enhancing its fragrance and aroma. 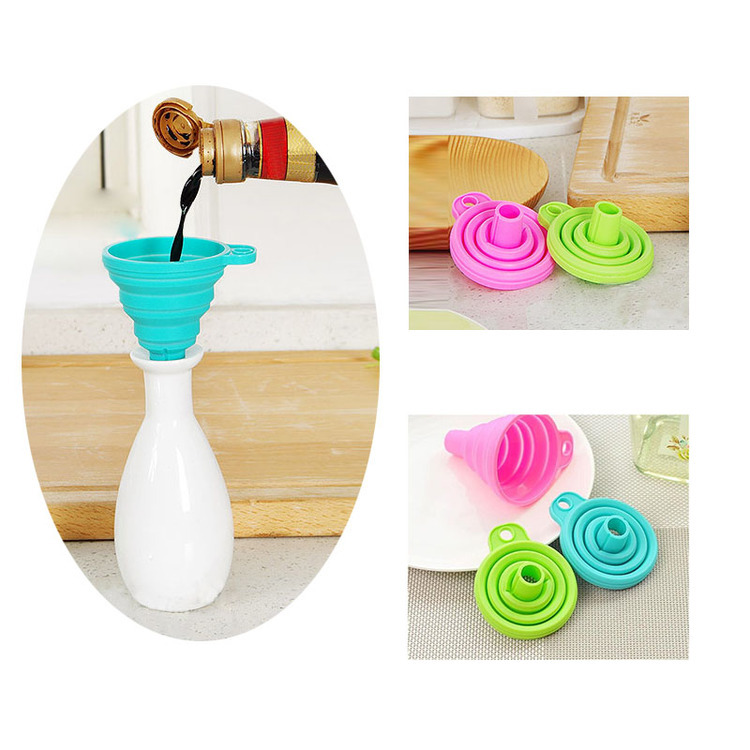 This silicone funnel is made of food grade silicone, easy to transfer ingredients without messy spills. 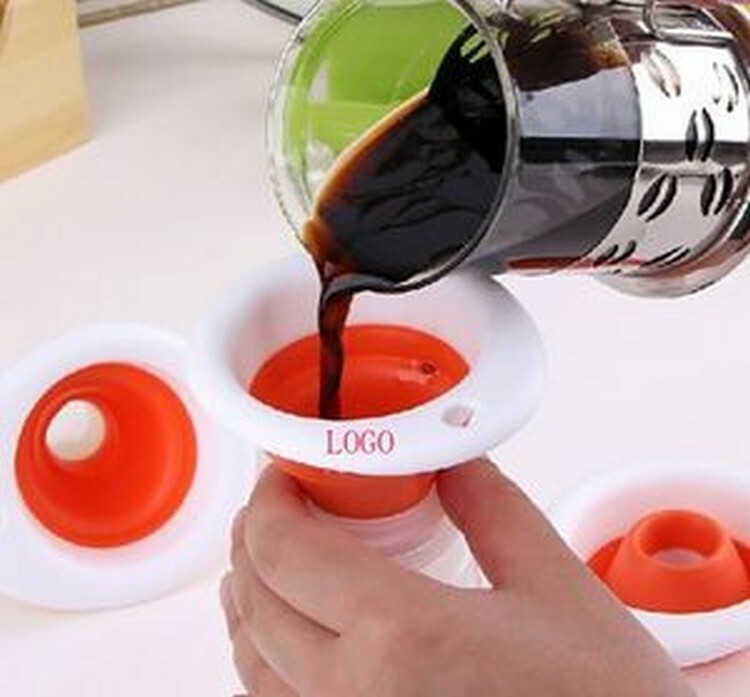 Perfect item for canning and other kitchen tasks such as pouring oil in a cruet or salt into a shaker. Customized imprint comes on the top area. A hanging hole comes on the top funnel. This is ideal promotional product for cookware, supermarket promotion. Complies with Food Grade. Made of durable BPA-free & food grade flexible hygienic silicone that will last forever. Safety & health, It has collapsible function which makes it very small and easy to store anywhere. Easy and convenient for anyone in the family to use, can be used for so many things for both adults and children. This set contains three items: Wide top basin (3 1/2" diameter) with closed bottom but with 6 holes drilled around the circumference of the stem. The wine splays outward from the holes. 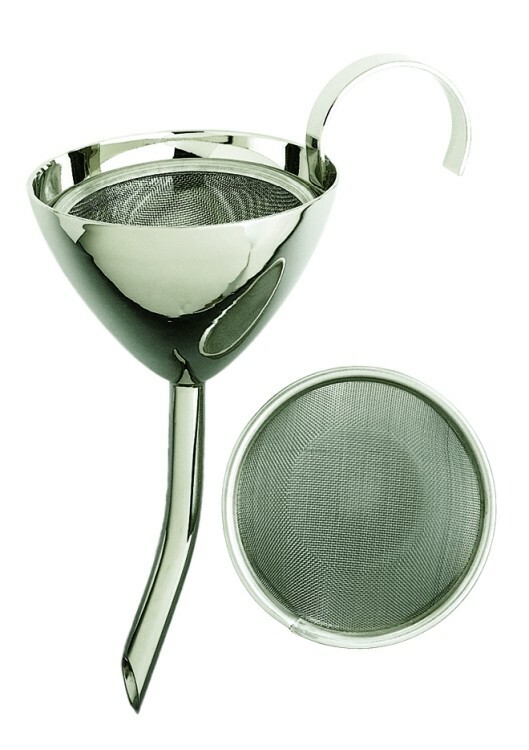 Concave stainless steel fine mesh sediment screen drops into top basin of funnel. Table stand. 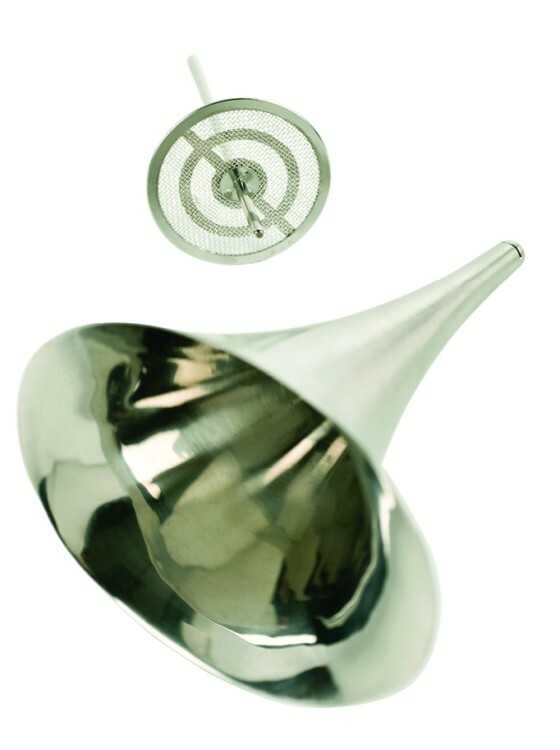 Flask Funnel. 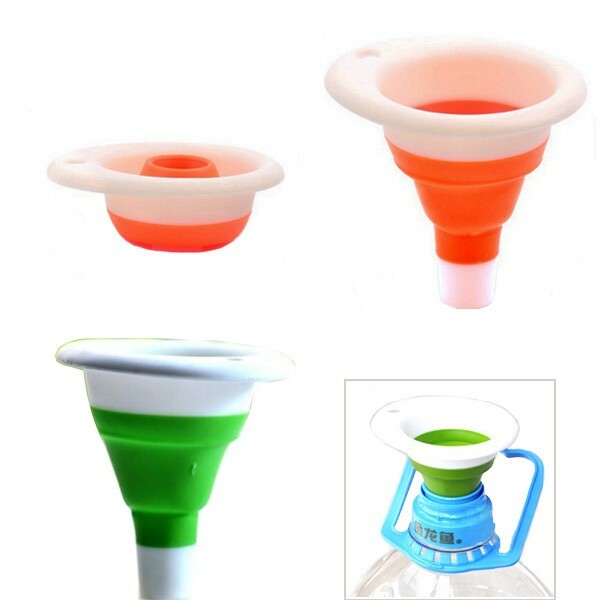 -Bowl diameter: 1-1/2" -Bowl Depth: 1-1/2" -Height: 2"
The funnel is made of organic environment-friendly silica gel, which is durable and can be reused. It is suitable for kitchens or outdoors, because it can be folded and stored, even in shallow drawers. The transfer of liquid or dry ingredients is feasible and keeps stable in bottles or cans. It can be a promotional gift for the trade show. 3 1/4 "diameter x 2 13/16" H. It has high flexibility and deformability, stability, durability, fall proof, anti-skid, corrosion resistance, food grade silicone safety, non-toxic and harmless, in line with the safety and health testing of FDA in the United States. Welcome your logo. Welcome your color and logo.